Clean: Meaning the buffer is now unpinned and is a candidate for immediate aging out if the current (data blocks) are not referenced again. The contents are either in synch with disk or the buffer contains a CR snapshot of a block. Free/Unused: Meaning the buffer is empty because the instance just started. This state is very similar to Clean, except that the buffer has not been used. Dirty: Buffer is no longer pinned but the contents (data block) have changed and must be flushed to disk by DBWn before it can be aged out. NOTE: Because SGA MAX size already fill-up so need to increase SGA_MAX size or decrease database buffer cache size/redolog buffer cache size/shared pool cache size. This statistics is the number of buffers skipped to find a free buffer. Buffers are skipped because they are dirty or pinned. 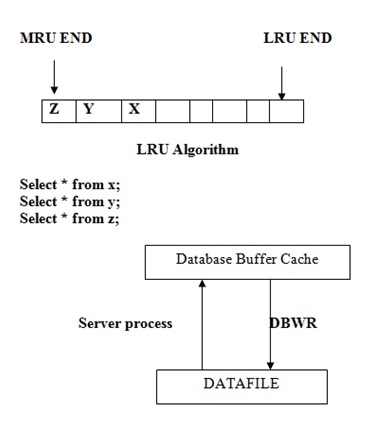 buffer busy waits indicates that there are some buffers in the buffer cache that multiple processes are attempting to access concurrently. You can take advice before increasing your db_cache_size. If only FTS occur normally this table result will store LRU but after executing this query always this table result store in LRU. After this query only if FTS occurred it will store in LRU. If where clause use then use there index. Check that the files are equally distributed across all devices. If that produces no effect get faster disks or place offending files onto faster disk.